U.S. Sensor Corp.®, acquired by Littelfuse in 2017, is continuously improving our measurement equipment and training of our test personnel. Our total expanded uncertainty in temperature measurement is less than ±0.003°C from -40 to 110°C. Uncertainty above 110°C and below -40°C is only slightly higher. The total expanded uncertainty includes all factors present in the temperature measurement process: equipment, environment, personnel, etc. We evaluate both repeatability as well as reproducibility. Uncertainty is calculated in accordance with NIST Tech Note 1297 (root sum squares with k=2). 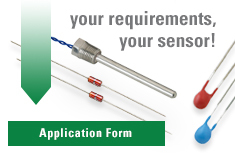 Littelfuse maintains traceability in Resistance with a complete set of Leeds and Northrup Standard Resistors. This set of standard resistors has calibration data that dates back to 1966. The calibration data is plotted in control charts and our long-term stability for these devices is between 0.002% and 0.004%. Total drift since 1966. In the event that you should experience a problem with a Littelfuse thermistor, RTD or probe assembly, our test facilities and experienced personnel are available to perform failure analysis on your devices. Our Metrological capabilities include Temperature, Resistance, Mass, Length and Time to assure that all our measurements are traceable to the National Institute of Standards and Technology and meet or exceed our customer's requirements. Our equipment is constantly maintained and upgraded as required. The environment of our laboratory is constantly monitored and controlled to avoid any adverse effect that ambient temperature fluctuations may have on the Thermal Coefficient of the electronic measurement devices. Our personnel are trained and tested on a regular basis to assure that measurements are made consistently throughout the laboratory. Outside training includes courses and programs sponsored by NIST, or closely affiliated with NIST, to assure up-to-date information and practices are implemented in the Littelfuse Quality/Test department.